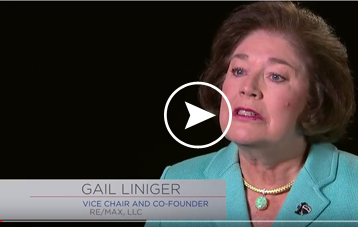 When Dave and Gail Liniger founded RE/MAX, it was one office with one employee. What began in 1973 as "a pad of paper and a dream" is now a global real estate franchise network that spreads across the world. Along the way, RE/MAX fundamentally changed the way the real estate industry conducts business. In an industry rife with mergers and acquisitions, RE/MAX is the only major real estate network still owned and directed by its original founders. By attracting the industry's best agents and providing them with training, support and the freedom to run their business, the RE/MAX network has a sales force second to none. RE/MAX Associates average more sales per agent and hold more professional designations than other sales people. They have set industry heights in productivity by mastering the latest technologies, sales strategies, marketing innovations and business systems. RE/MAX's market share has grown continuously since 1973. This success arises from RE/MAX following a simple formula; combining quality, professional agents with its global brand awareness, premier web presence, high customer satisfaction and local community involvement. RE/MAX advances its growth by following a simple philosophy that "Everybody Wins." The success of the RE/MAX network depends on each RE/MAX Associate providing unparalleled satisfaction to each of his or her customers. Advanced education, technological expertise, and experience all translate into quality customer service and network growth, a real win-win result. The combined promotion of the RE/MAX brand by RE/MAX and its worldwide sales force has made the RE/MAX brand with its red, white, and blue balloon one of the most recognizable business brands in the world. RE/MAX also has the world's largest balloon fleet to help promote its brand awareness. The success of the RE/MAX network depends on each RE/MAX Associate providing unparallelled satisfaction to each of his or her customers. Advanced education, technological expertise, and experience all translate into quality customer service and network growth, a real win-win result. The combined promotion of the RE/MAX brand by RE/MAX and it's worldwide sales force has made the RE/MAX brand with its red, white, and blue balloon one of the most recognizable business brands in the world. RE/MAX also has the world's largest balloon fleet to help promote its brand awareness. RE/MAX stands for "real estate maximums"
Since 1973, RE/MAX has massively expanded its network and now has more than 100,000 agents in nearly 8,000 offices spanning 96 countries and territories on six continents. Young in years but mature in experience, RE/MAX looks ahead to even greater development and success in the years ahead.